As promised, I'm writing to take a closer look at gender roles in Disney's The Princess and the Frog. As I explored in the previous post, I think that there are still a lot of racial complications in this film. There are also some negative gender stereotypes portrayed, but, for the most part, I see a lot of progressive work going on in breaking down the standard princess-must-find-a-prince tale. In order to give the film credit where credit is due, we have to take a quick look at the way the Princess trope has played out in films past. 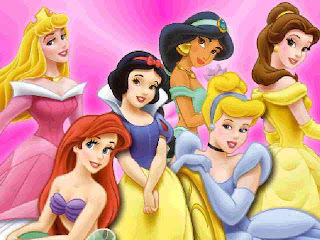 Wikipedia lists the following Princesses as part of the franchise: Snow White, Cinderella, Aurora, Ariel, Belle, Jasmine, Pocahontas, Mulan, and Tiana. So, what does TPATF do with this trope? Tiana isn't waiting around for a prince. She has a dream, and her supportive parents helped her to grow into a woman who would work to make it come true. She wants to own her own restaurant so that she can share her talent of cooking with others while making a nice life for herself. It's Charlotte who fits the typical princess trope, and her role in the film works to (gently) mock it. On the flip side, we have Charlotte LaBouff (Lottie), passively sitting and waiting for her prince to appear like a good Disney princess. But she is clearly not the heroine, and the audience is expected to roll their eyes at her behavior, not to want to emulate it. [T]he themes of entrepreneurship and division of labor in the household were so crucial to the film it was kryptonite for any red-blooded feminist. The idea that men can and should play a role in food preparation and that women can own their own business while building viable, healthy relationships was so groundbreaking for a movie with the word “princess” in the title. For this, Disney deserves their props. But she doesn’t seem to care that he’s a prince at all; there’s no indication they even visit his country. Instead, she builds her own palace. This is like if at the end of Coming to America, Eddie Murphy decided to stay in Queens and help Lisa open a whole chain of McDowell’s restaurants. The thing that I find the most refreshing about the gender roles in TPATF, however, isn't illustrated through Tiana at all. It's the character development of Prince Naveen. In the other Princess films, the princes are lucky to say more than a few lines. We focus a lot on how the princesses get trapped into waiting for a prince to save them, but the princes are equally trapped, and they are completely stagnated by that role, unable to develop at all. Their characters are almost entirely static. Beauty and the Beast broke out of this box a little, but only to first move the prince backward, making him into a monster that then gets to turn into the personality-deprived typical prince. The Princess and the Frog moves away from these habits. For the body image problem, Naveen's frog-body works to undercut the tall, broad-chested, muscular version of princes we normally get. Naveen develops into a dynamic character before he ever changes back into a human, illustrating that it is not the masculine body that gives him this opportunity. Prince Naveen starts out with a fairly undesirable personality, but it is a personality. His intial qualities are summed up pretty well in the song "When We're Human Beings." He's a lazy, privileged womanizer who can't wait to return to his human form and marry someone with money so that he can return to a life of leisure. (It's pretty sad when this is an improvement over the previous princes). But we can't really blame him for being this way. After all, it's the logical conclusion of the prince trope. If a prince gets to sit around in luxury until the one moment he's needed to rush off and kiss some sleeping/trapped/poisoned princess before slipping into happily ever after, he's probably not going to be too motivated to work hard or learn conversation skills. But Naveen's interactions with Tiana are different. He can't win her over with a kiss (in fact, the kiss is what turns her into a frog and takes her further away from her dream of owning a restaurant). He's not the solution; he's the problem. While they interact, they actually get to know one another. (Granted, the courtship is still a matter of days--probably not long enough to justify the marriage that quickly follows, but it's a start). It's only after getting to known Tiana that Naveen becomes attracted to her, eventually leading to a (almost) proposal. During the proposal, Naveen tells Tiana, "You've been quite an influence on me." Later in the scene he says that he has dated "thousands of women" but that Tiana "could not be more different" because she is "practically one of the guys." Tiana illustrates to Naveen that a woman does not have to stay fixed in the ascribed gender roles (though I do think it's problematic that the only language he has for this is calling her "one of the guys," denying her the ability to have both agency and femininity, but he recognizes his mistake and backtracks). By seeing that she has stepped outside of those roles, he finally finds the freedom to step outside of his. He is no longer looking for a woman who needs him to rescue her. He's now looking for a partner, one who joins him out of companionship, compatibility, and love. This is underscored by the scene that unfolds after their marriage. They buy Tiana's restaurant not with his royal riches (because he's presumably still cut off from the money), but with Tiana's hard-earned waitress tips. They fix the place up themselves, working side by side. They are truly working together to make what is now a joint dream into a reality. I know that some feminist see the fact that Tiana is willing to give up her chance to be human because she's fallen in love with Naveen as a bad sign, but the recognition that meaningful relationships are more important than monetary goals is still something I can get behind. And it is only Tiana's independence, personality, and hard work that give Naveen the chance to develop into a non-stereotypical prince. Gender roles exist as a dichotomy, so breaking down one gives us the chance to break down the other.